Apps are programs you have to open by touching a shortcut. To save yourself some time, add your favorite apps to the Home screen of your phone. 2 Touch and hold the app you want to add to the Home screen. 3 Drag the app to the desired location and then release it. 1 Touch and hold the app you want to remove from a Home screen. 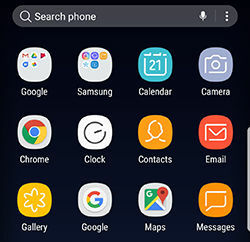 Galaxy S8+: How do I manage apps on my Samsung Galaxy S8+ (SM-G955W)?